I've been doing Manga Mondays every week since I started my blog 22 months ago. It's always been a personal feature, but now I'm going to try turning it into a meme. There are quite a few people who do Manga Mondays. I don't claim by any means that I owned or created the idea of Manga Mondays - it's an obvious choice given the alliteration. I think a meme would be a good way for everyone to publicize their own Manga Mondays and get a little more publicity. Manga originated in Japan. The style has since expanded to other countries, including Korea. Manga is known as "manhwa" in Korea. I've read reviews of several manhwa series and wanted to venture into the genre. 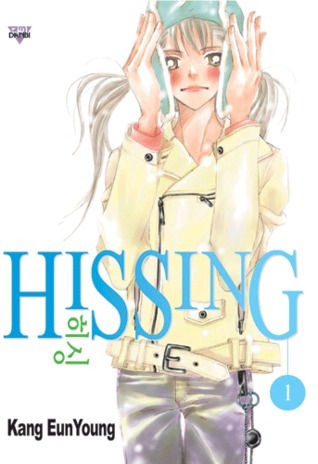 I randomly picked Volume 1 of Hissing, since it was at my library. In retrospect, I should have picked a series that I knew other people liked, because Hissing isn't very good. I didn't notice a distinct difference between manga and manhwa as far as plot or art went. The main differences were subtle - cultural differences. Names, for instance. Instead of common Japanese names like Yuki, you have Da-Eh and Sun-Nam in this series. I also noticed different foods. The common Korean food kimchi was featured in this volume. No Japanese sushi or miso to be found. Another thing I noticed was epithets. Christianity is much more prevalent in Korea than in Japan (30% v. <1% according to Wikipedia). They characters shouted "Oh my God," or "Christ," when they were surprised or irritated. I've never seen that in manga. I'm not sure whether that's common in manhwa or just words this author likes to use. Hissing has potential to become an interesting series. There is a soap opera-ish melodramatic connection between the characters that was hinted at in the first volume, focusing on Da-Eh's younger brother. But the first volume didn't make me care enough to continue. It's really confusing. There are two guys: Sun-Nam and Ta-Jun. Sun-Nam was a bigger character - a wimp who's been tortured by his tough older brothers his whole life - and now acts like a jerk to get people to think he's tough. I'm not sure who Ta-Jun was. Every time I thought the volume was talking about Ta-Jun, it turned out to be Sun-Nam. They were drawn very similarly. I did like that Da-Eh wants to be a manhwa artist, because it talked a little about the process of drawing manhwa. But I didn't get a good feel for Da-Eh's personality. She wants to be a manhwa artist, loves her little brother, and doesn't fall for guys easily but that's all I got. I also noticed a few typos that were distracting (such as using "who's" when it should have been "whose"). Also, the volume read front to back and left to right, just like western style books. I've gotten so used to Japanese right to left format that I started Hissing at the end. I read about ten pages with great confusing before I figured out that I was reading the wrong way. I would like to continue reading manhwa since Hissing is no more representative of manhwa than bad manga is representative of manga in general. I read a bit of Hissing too but dropped soon after since it was confusing and didn't really hold my interest. I still do that with manhwa sometimes - reading them as if I would manga! If you want to try some manhwa, two of my favorites are: Bride of the Water God and You're So Cool. I hope you continue reading manwha there are a lot of good ones out there. There are some of the confusing ones too. Some I stopped reading because they were making my head dizzy trying to keep up with what was going on. Some manga is like that too though. I've never heard of this series before, but judging it from your review I don't think it would hold my interest either. The only manhwa I've read are the Color of Earth series, which was really good and told the story of mother and daughter. The art work and the language was something that I had to get use to but it didn't deter me from enjoying it. Do you follow A Girl, Books and Other Things? She's a manga chick, too--you all can compare fave series! I really like the cover of this one.